our dear old species will likely be saved by a Windows crash. The poor robots will linger pathetically, begging us to reboot them, even though they'll know it would do no good." Imagine, if you can, a world where devices called in-home "nanotech regulators" (never mind that we have no idea what those are) will transform dirt, air and seawater atoms into, oh yes, food, clothing and appliances at effectively no cost. This is no "Jetsons" episode. It's what proponents of nanotechnology believe is nigh, perhaps by the mid 2020s, and would fundamentally change commerce, and reality, as we've known it. Dirt being transformed into a washing machine in our own homes might be a bit much to wrap our heads around. So try this one: Imagine going to a drugstore to fill a prescription and not interacting with a human pharmacist. In fact, you can. UCSF is currently testing an exclusively robot-run pharmacy. Electronic gas pumps made for our first experience with innovation wiping out an entire swath of laborers - displacing gas attendants and offering no natural replacement work for them. Next came the Internet and digitization along with it. The death of the gas station attendant looks quaint compared to the job destruction digitization wrought. When was the last time you called a travel agent? Or used a phone book? Enter robots, another innovation that might be the next job killer. By stretching automation into several more corners of the workforce, machines replacing human labor is looking less like science fiction and more like reality. Consider Kiva Systems, a company striving to automate warehouse fulfillment (and one that Amazon just purchased for $775 million). Kiva has invented robots that move inventory to the shipping station so that employees don't have to. Orders are placed more efficiently, humans are less subject to injury, and fewer errors are made. Pretty cool, right? Yes, but what of the warehouse workers whose jobs will be lost as robotic efficiency gains render them redundant and less effective? Warehouse and distribution centers have already made reductions in their human workforce due to automation. Many in the robotics industry, however, believe that robots will be a boon for workers as they are freed from mundane, mindless tasks, allowing them more time to train for higher skilled, higher paid tasks. 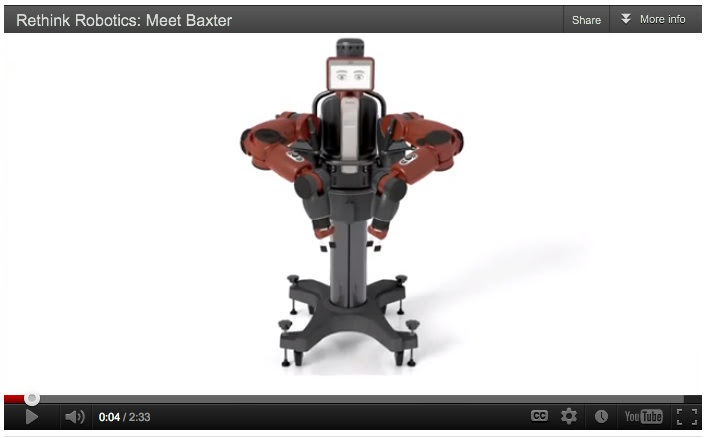 Meet Baxter, a $22,000 robot with common sense that you could easily train to do the rote parts of your job. Baxter's doing the mind-numbing tasks, and all of a sudden you get promoted to management and are using a higher skill set. Win-win, right? Only if you assume higher skilled jobs will always be there. This also assumes that robots with the capacity to perform high-skilled tasks won't soon usurp those higher skilled jobs as well. Robots were once relegated to simple, repetitive tasks, but now massive leaps in technology have given them the ability to perform specific, singular tasks - "knowledge work." Not to mention the economics. Robots tend to be cheaper, can work 24 hours a day, 365 days a year, are less prone to error, don't complain, don't need breaks and mean far fewer headaches for managers. Is there any reason to believe that just like blue-collar jobs have been lost to automation, white-collar jobs won't follow suit? Sure, you have a college degree, maybe even a master's, and you've been promoted to management. But can we still be sure your white-collar job is safe? In this war of Man v. Robots in the battle for jobs, there really is no telling who will win. But we do know this: Most of us will live to see who does. Read on in our special section about advancements in robot technology and what all this automation means, the good, the bad, and the ugly. "Unless mankind redesigns itself by changing our DNA through altering our genetic makeup, computer-generated robots will take over our world." Well, each presidential candidate spent over $1B on his campaign and what did we end up with? The same thing we had before. Might this multi billion-dollar blitz be yet another example of money wasted on things that don't drive a worthwhile economy? Two billion dollars put into media...So is media, along with financial services, the best our economy has to offer now? How might that play in a global economy that actually runs on making things for consumption? At least Hollywood makes movies that are consumed for leisure. What economic value do we gain from the constant banter of talking heads debating this, that, that and this until way after the cows come home? Oh...forgot...cows don't matter in a financial and media based economy. The big question no one seems to be asking is if President Obama will finally embrace economic policy that promotes true organic growth now that he doesn't need votes from his environmental, media, financial services, union and government-dependent constituencies. Will he continue to constrict our organic industrial economy because carbon is destroying the Earth, or will he decide that saving the country is more important than saving the planet? As if it needs to be saved? Climate change hysteria looks a lot like the hysteria of 20 years ago that Japan was going to eat our economic lunch. The power of the mob just moves from one sensationalist topic to another. Thank you, media! A quick Google search will reveal that New York has actually experienced 84...yes, 84 tropical or subtropical storms in recorded history. Now who would have thought? Our economy remains in limbo, with a giant unknown: What will drive the President in his second term? Taking action to prevent history from calling him the Captain of the Titanic? Or taking action that protects some rare toad over job creation and our economy? Policy limbo is never good for employment, but at least we can be thankful for the one silver lining in our otherwise lackluster economy - natural resources. The oil and gas shale geographies are experiencing a gold rush of economic activity and hiring. As the center of energy innovation and management, Houston is today's boomtown. Look around H-town and you see out-of-state license plate after out-of-state license plate. Look up at the horizon and you see construction crane after construction crane. In Houston, it sure feels like the good ole days are now. Hiring is quite robust here, and in the shale geographies. I suppose Helicopter Ben should get some credit for his penchant for printing money, which has enabled expansion in residential real estate development and construction, albeit at a rate still significantly below 2007. But growing jobs is good for any economy, even if it comes from monetary alchemy. No one wants the alternative. Right now in our financial services market, we see an odd mix of trends and activity. European financial institutions need to return to Europe. It's time to pack up that fun condo in the city and return home to save the family farm from burning down. At the moment, European banks subsist only on the good graces of the EU's constantly changing stimulus policy and their printing press. If anyone really cared to pay attention, Europe's financial industry seems to be playing a similar game as the U.S. Savings & Loan industry twenty years ago..."I'll buy your debt if you buy mine." Expect more job contraction within European banks. U.S. financial institutions are benefiting from the Federal Reserve's extremely accommodative monetary policy. For now, U.S. regional banks seem interested in taking up the slack of any European contraction. Expect job growth with U.S. super regional banks. Accommodative monetary policy is also keeping institutional money managers active in the alternative investment markets of private equity and hedge funds. When what is earned on mandatory fixed income portfolios doesn't match up with outflows for pensions and insurance policy claims, institutions must reach for a bigger and bigger yield. Consequently, private equity and hedge fund markets remain quite active. At minimum, the alternative investment job market should remain reasonably steady. The key to success is simple...Always exceed expectations. More often than not, a simple statement can provide more insight and inspiration than an entire book. Unemployment rates were lower in October than a year earlier in 329 of the 372 metropolitan areas, higher in 37 areas, and unchanged in 6 areas. Three areas recorded jobless rates of at least 15%, while 41 areas registered rates of less than 5%. Yuma, AZ and El Centro, CA recorded the highest unemployment rates in October 29.8% and 28.1%, respectively. Bismarck, ND registered the lowest unemployment rate at 2.2%. From December 2011 to March 2012, gross job gains from opening and expanding private sector establishments were 6.9 million, an increase of 26,000 from the previous quarter. Over this period, gross job losses from closing and contracting private sector establishments were 6.1 million, a decrease of 399,000 from the previous quarter. Employers took 1,360 mass layoff actions in October involving 131,173 workers as measured by new filings for unemployment insurance benefits during the month. Each mass layoff involved at least 50 workers from a single employer. Mass layoff events in October increased by 44 from September. 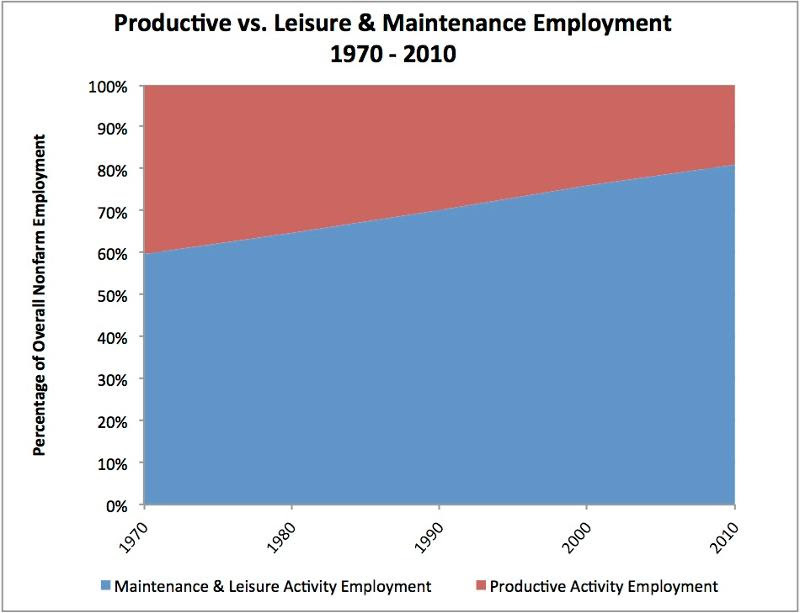 The chart below shows total share of employment as divided by Productive Employment (goods producing) and Leisure & Maintenance Employment. Productive Employment includes: mining & logging, construction, utilities and manufacturing. Leisure & Maintenance Employment includes: trade & transportation, information, financial services, professional & business services, education & health services, leisure & hospitality, and other services and government. The trend is glaringly clear - our goods-producing labor has dramatically reduced as an overall share of employment. The two biggest culprits are cheaper labor overseas and automation killing goods-producing jobs. and I'm rooting for the machines." This NYT article takes a comprehensive look at the state of robotics and its intrusion into the human labor force. Read on for what it might mean in terms of employment, unemployment, policy, our global competitiveness, and what could amount to an actual war for jobs between laborers and robots. It's as though a futuristic sci-fi movie will play out before our eyes, just with fewer laser guns. Canon, a Japanese company, recently announced that by about 2015, some of its factories will be entirely automated, meaning they will employ no humans. To assuage concerns about mass layoffs, Canon's spokesperson said that displaced Canon factory workers can move to new kinds of work. What this work is remains to be seen. 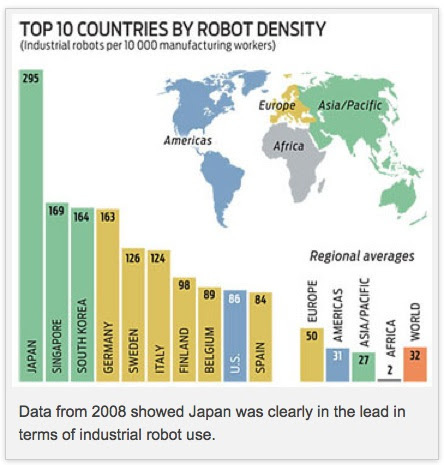 The following chart looks at the share of robotic workers against total workers by country. Since Japan is already the leader in industrial robot use, adding even more can't be good news for Japan's persistently stagnant economy. Will robots and automation make human workers obsolete? Futurists Ray Kurzweil and Peter Diamandis believe perfected artificial intelligence will cause technological progress to move so rapidly that most humans won't be able to keep up. Some worry that this will create a "digital divide," where only a fraction of the population is able to benefit from new technologies. Kurzweil and Diamndis dismiss this pessimistic view on the grounds that innovation drives down the cost of technology, making it accessible to more people. But will there be enough jobs for people to benefit overall? In which direction would such a paradigm shifting technological event push our economy? While some jobs, like construction workers, remain less vulnerable to the robot threat, these nine job categories are viewed as particularly vulnerable: pharmacists, lawyers and paralegals, drivers, astronauts, store clerks, soldiers, babysitters, rescuers, and sports writers and reporters. Read on to see how robots have begun to encroach on human work territory. 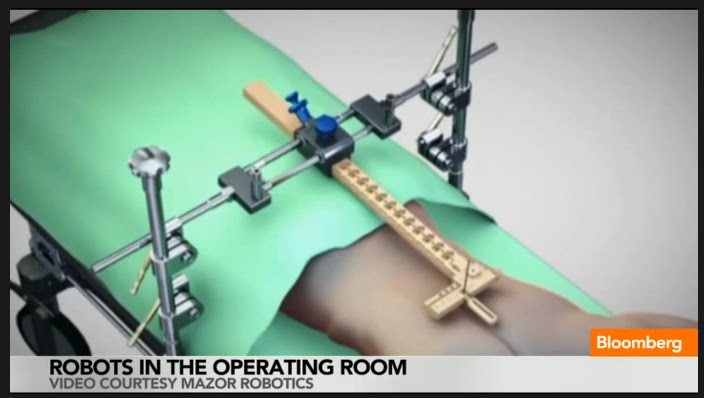 The CEO of Mazor Robotics, Ori Hadomi, speaks about the robots his company is building to perform and reduce error in highly complex human surgeries. While Hadomi says that robots will never replace actual surgeons, he believes they will play an ever more pivotal support role while increasing the success rate of high-risk surgeries. 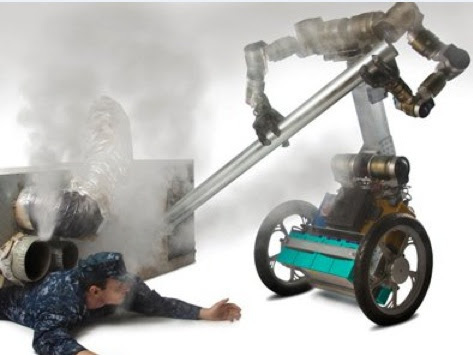 Follow the link for 10 incredible robots that will change the way the Military goes to war and helps protect itself and others. A favorite: The MacGuyver Bot. "Designers put the MacGuyver Bot together with disaster relief in mind. Its arms and hands are incredibly dexterous, enabling the bot to literally 'make' tools on the spot, depending on what it needs to help humans out of tight positions." In 2000, there were six working-age Chinese laborers for every person 60 and over. In 20 years, this number is expected to be two. Holy labor shortage, Batman. To combat this trend, China is turning to robots. Foxconn, a Taiwanese company primarily known for building iPhones, plans to expand its fleet of robots from the current 10,000 to 1 million in three years. Chinese Robots have also been seen slicing noodles in restaurants, pulling rickshaws, and lighting people's cigarettes. MIT interviews Andrew McAfee, co-author of the not-so-optimistic book Race Against the Machine that discusses how automation is permanently killing scores of jobs. While not comforting, we've grown accustomed to seeing blue-collar jobs disappear to automation. McAfee believes that white-collar jobs are next on technology's chopping block. Protracted out, this trend means persistent unemployment problems and less wealth concentrated in even fewer hands. McAfee suggests companies should seek to determine the optimal mix between human and digital labor. He advises kids today to plan for careers in fields where computers continue to prove deficient. "For now, we assume that self-evolving robots will learn to mimic human traits, including, eventually, humor. And so, I can't wait to hear the first joke that one robot tells to another robot." The interactive chart below shows the state-by-state jobs gap, which is how many jobs need to be created in each state to return to pre-recession employment levels. The greener a state, the smaller the jobs gap. 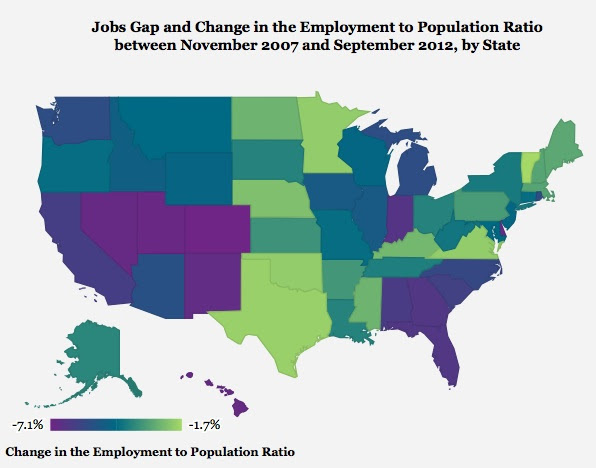 The more purple, the larger the jobs gap. Salaries in the mining, oil and gas exploration industry continue to soar thanks to strong oil demand and improved extraction technologies. Wages in this industry were the first to see improvement since the recession, and have had the most consistent growth since then. In the past year, energy wages grew 4.9%, putting them at the top of all industry wage growth. Are you a good crisis leader or prosperity leader? Crisis and growth leadership require distinct skills. People tend to feel more natural leading in one or the other scenarios. This article lists which skills are crucial to effective leadership in both cases. How well a doctor listens to a patient is highly correlated to treatment outcomes. Listening is powerful, yet compared to its cousin, speaking, improving listening skills doesn't get much airtime. GE's Jeffrey Immelt called "humble listening" one of the most critical attributes of good leadership. Read on for four simple ideas to improve your listening skills and maybe your leadership skills. There is something in this article for every hiring manager. Any manager knows that keeping staff motivated is challenging, but vital. These three simple questions are designed to help you understand what matters to your employees so you can manage them accordingly.